The Jim score: 2, to be polite. It was pointless. It was with trepidation that I started this challenge. There was a lot of ‘Oh Dave, what are you doing to me? Why would I make processed cheese? This sounds a bit too chemically and sciencey for me. I just like good solid meal’. But THEN I thought ‘well I suppose I am meant to be doing something that I wouldn’t normally do. That IS the point of this blog’. So after a bit of confusion, I ordered my digital scales, got the ingredients and set myself up whilst visiting The Ma. I used this recipe to start with but used the cheese I had, rather than following the recipe to the letter. Also, because I was dubious about the challenge, I halved the ingredients. First things first. 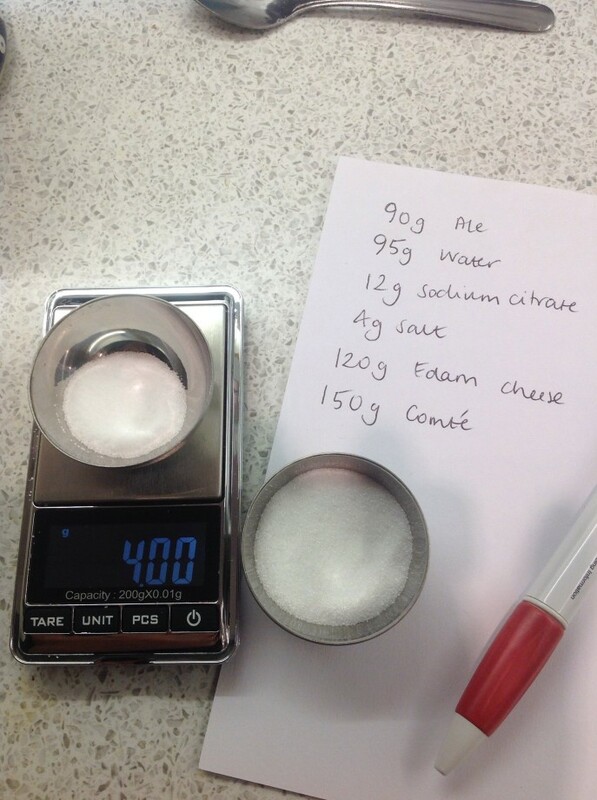 Don’t be confused as I was when using a scale which measures to 0.01g – it made me very confused – why I don’t really know – but I had to weigh everything at least twice. 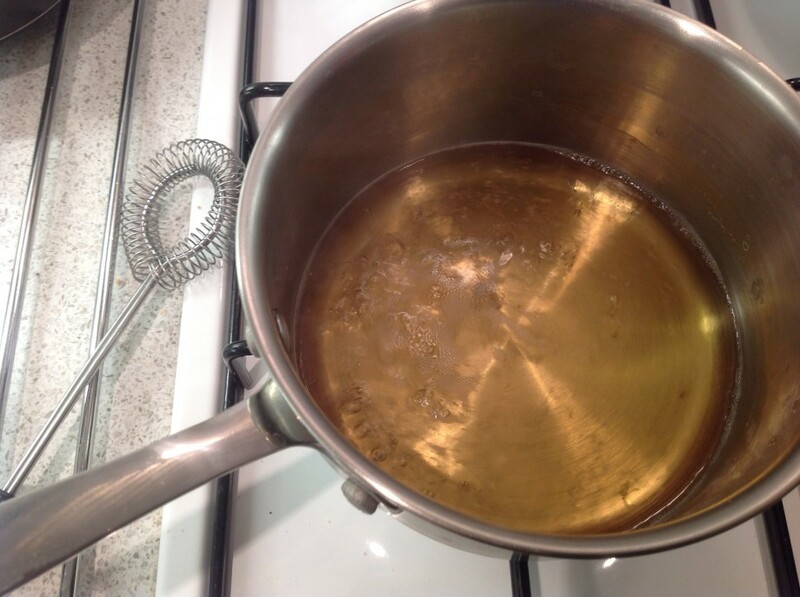 Put the beer, water, sodium citrate and salt in a medium saucepan over medium heat. 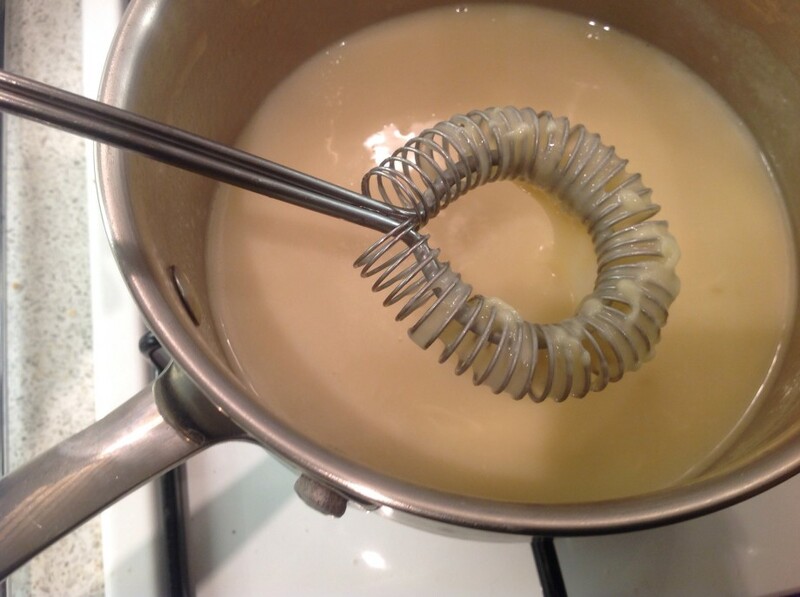 Bring it to the a simmer, whisking it until everything has dissolved. 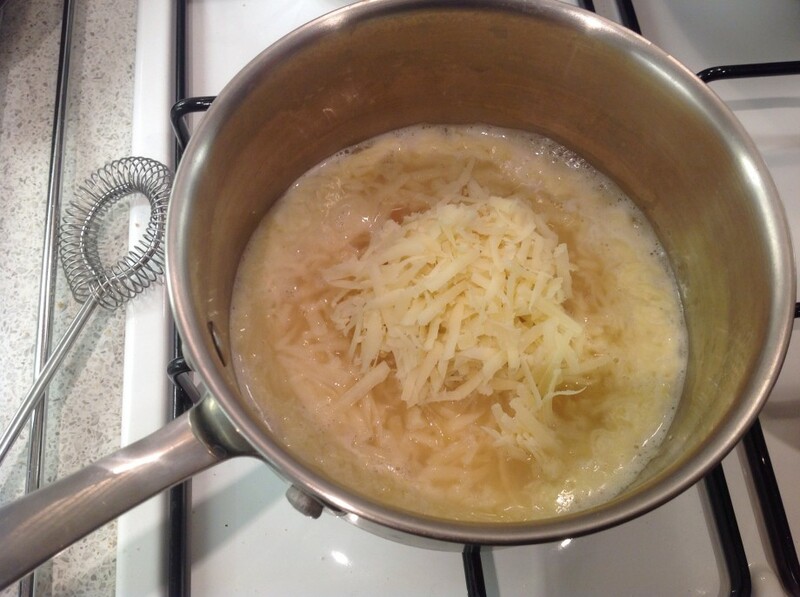 Then add in the cheeses and whisk until completely melted and smooth. It really looks like it won’t work and it just looks like a mess but ultimately it dissolved. 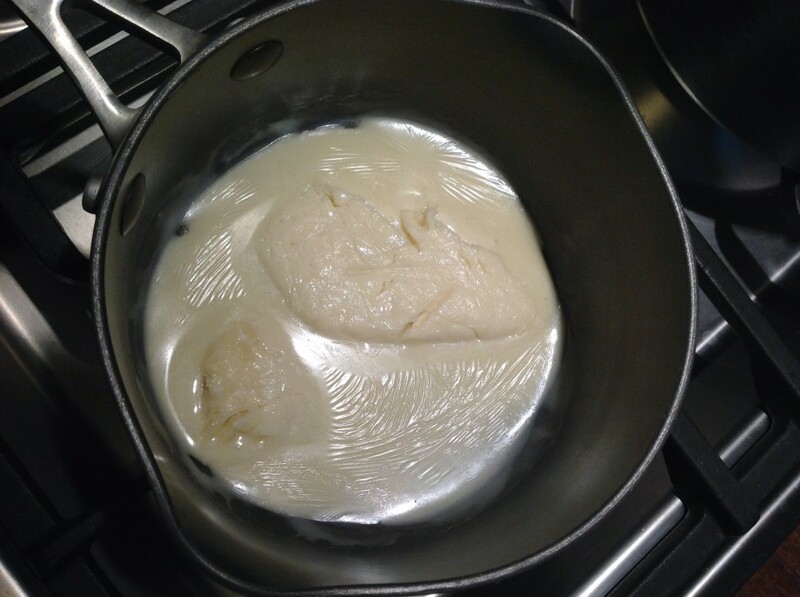 Keep at it – just whisk away and soon enough, you’ll have a very smooth cheese sauce. 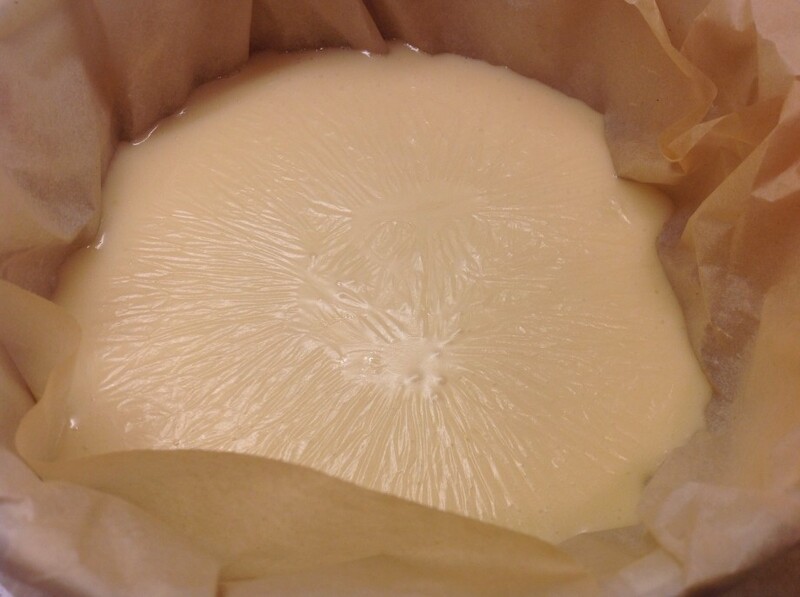 Once it was all smooth, I poured the mixture into a tin lined with baking parchment and left to cool. Very quickly it had a custard like skin on the top. And pouring it out was odd – it was like some gunge from the fun factory which hardened pretty quickly. Anyway, when it was totally cool, I wrapped it up and popped it in the fridge. The next day, I took it out and poked it. This cheesey splat was intriguing to my friend Joey, The Ma and The Jim. They kept asking why I had ruined two perfectly good pieces of cheese. I have to say I was of the same opinion.It looks shiny, smelt slightly weird and seemed quite like Dairylea or those Cheese Strings of nineties packed lunches. And I don’t believe that’s what cheese should be. 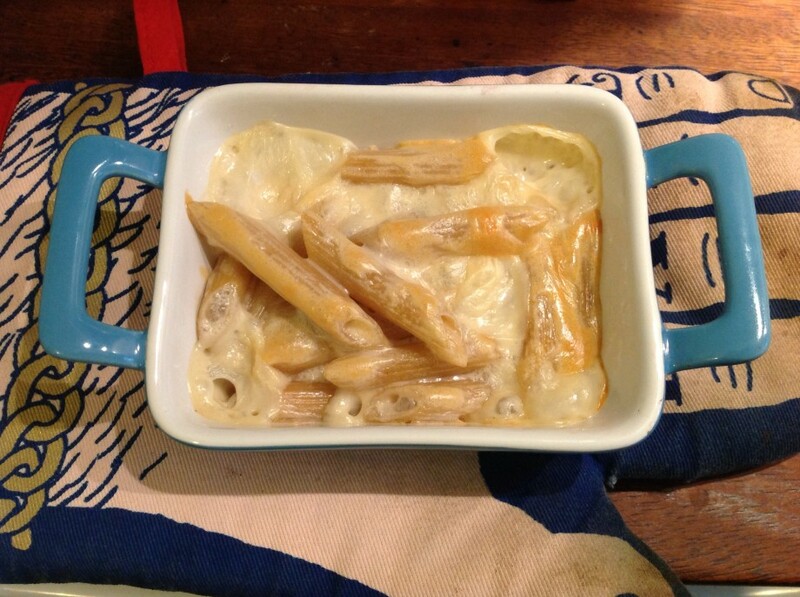 But I persevered nonetheless and finally the time came, a week after making it, to use it in a macaroni cheese. I made a miniature one, partly because I wanted to try it out and partly because I didn’t think we’d like it. Whether this was right or not, I couldn’t tell you as I didn’t use a recipe, but what I did was to take a chunk of the cheese, put it in a pan on a low heat and melt it. 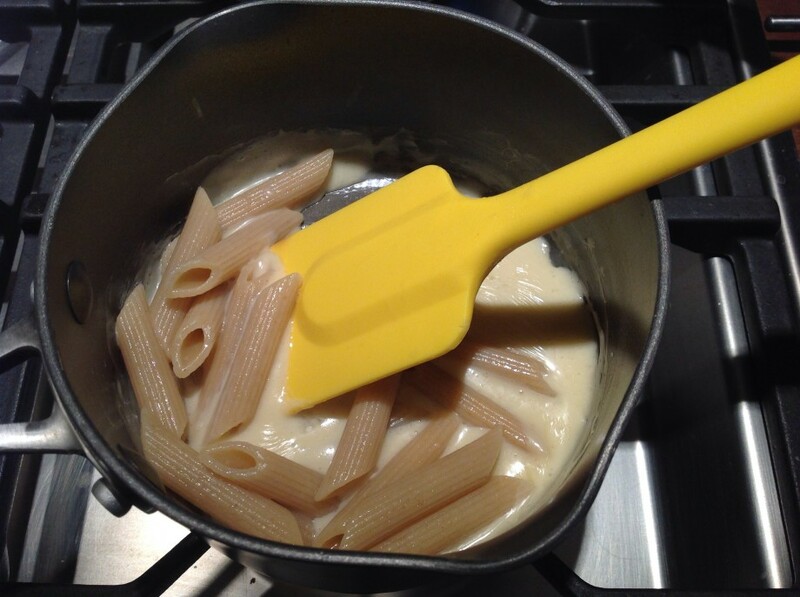 At the same time I boiled up some penne (not macaroni!). 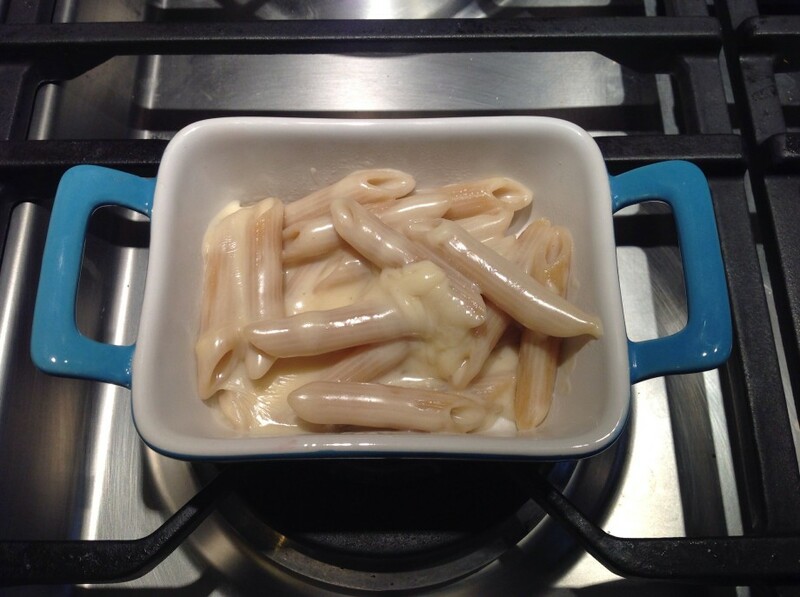 When the pasta was done, and surprisingly the cheese had melted back into that smooth, glossy substance, I added the pasta to the cheese glue, mixed it round and put it in a preheated oven until it was golden. Well, we ate it. Not because it was delicious, but because it was a bit creepy, savoury, kind of OK and we’re all pretty greedy. 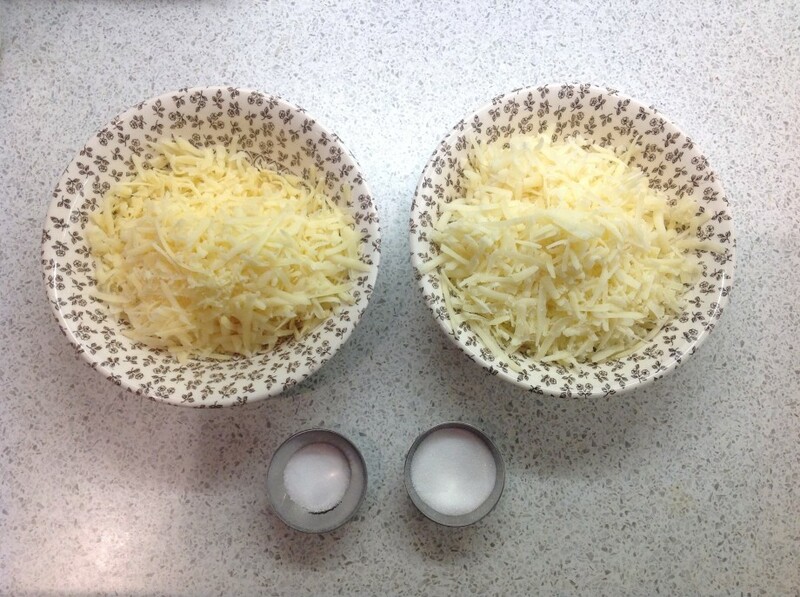 You see, I make a really good 4-cheese macaroni cheese, with a standard cheese sauce. I also don’t really like cheese on burgers. The Jim just couldn’t understand the point. It was the first one where he was a bit lost for words. Dave, I’m afraid this one is not one that’s passed the test – it might be my failings to give it a proper go – I’m sure it could be better but I just don’t feel my heart it in it. Give me another please. When I posted this, I knew it could go either way. You would either love the result, or you would hate it. I’m sorry that you hated it, because there’s a lot to love there. There were, though, a couple of reasons why I thought it was worth trying out. First and foremost, it provides the term ‘processed food’ with a little bit of context. A lot of people rail against “processed food”, and for no very good reasons. An apple pie is “processed food” – apple pies don’t grow on trees, people have to make (aka ‘process’) them. Processed cheese is often seen as an extreme example of processed food, but as you have seen, the ‘processing’ is way less complex that that involved in making an apple pie. I’ve already decided on your next challenge. It will be a very much more traditional technique, and I’ll write it up in the next day or two.